Hands down one of the best performing portable radios you will find today. With its whoppingly large 200mm ferrite antenna, its dual 2.5" speakers, and the RDS text function you would be hard pressed to find another portable radio that offers so much for so little. This lite and powerful radio is capable of being powered by the included AC adapter, 6 x 'C' batteries, and optional DC power you have the flexibility a portable should have. We could talk all day about its features and performance, but think that you are the best judge. Listen and learn what good radio is. Features: PLL Synthesized tuning system. 200mm Ferrite AM antenna - provides unmatched AM reception 10 Memory Presets (5 AM, 5 FM). Rotary Volume Control Rotary Tuning Control Auto Seek Station Stereo/Mono Selector Switch Headphone Socket 3.5mm Aux-in Socket. DC Jack (Adapter not included) Backlite LCD. Sleep Timer Radio Data System (RDS) function with radio text, station name and auto clock time. Alarm with Humane Wake System (HWS). Battery Life Indicator. AC Power Adapter (Included) Dimensions ( W x D X H): 10 3/4" X 5 1/3" x 2 2/3" Weight: 2 lbs. Batteries: 6 x 'C'. 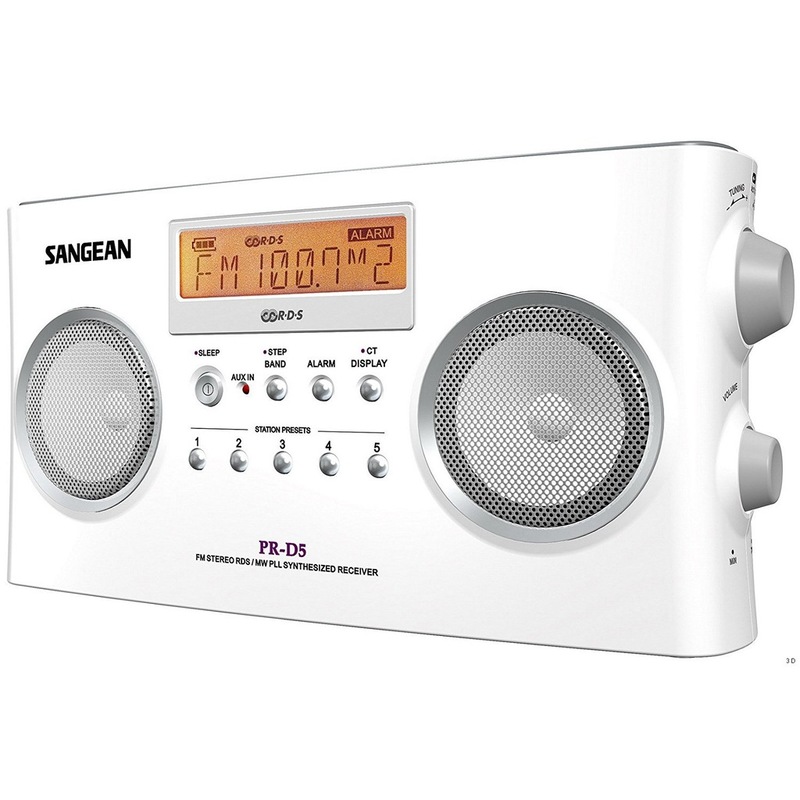 The Sangean PR-D5 WH is the last portable radio you will ever have to buy. It has an enormous 200mm ferrite antenna providing the best AM reception you have ever heard. Dual 2.5" special stereo speakers with Radio Data System (RDS) text function makes it a standout portable receiver. This light and powerful radio is capable of being powered by the included AC adapter or 6 C batteries. An easy-to-read LCD display shows you station and time. The segment-style LCD screen measures 3.2" x 0.8", and is backlit to be easy to see even across the room. PLL synthesized tuning provides exact, fade-free FM reception, while a 200mm Ferrite AM antenna bar allows exceptionally strong AM reception. Ten Memory Presets for 5 AM or 5 FM station selection are available and easily visible in the large LCD display. Fill your presets with Auto Seek, which finds your active stations automatically. A 3.5mm Aux-in socket allows you to connect your iPod, smartphone, or other portable digital music player using a male-to-male 3.5mm stereo cable. The PR-D5 WH features a sleep timer with a radio alarm to turn on your favorite station at a predetermined time. There's also a Humane Wake System (HWS) buzzer alarm, which wakes you up gradually with an incrementally increasing alarm instead of a harsh, instant noise. Display Size: 3.2" x 0.8"
Dimensions: 10.2" x 5.4" x 2.5"